In the past, we’ve featured assorted news items about how employers and insurers are turning to social networks to monitor employees for potential fraud. In fact, just last week, we learned about how the New York State Insurance Department’s Fraud Bureau recently cracked a case as a result of a Facebook posting. But social media and how it intersects with workers compensation is all still pretty uncharted territory. Given this, we were delighted to learn of a recent paper specifically dealing with this area of law: Social Networking and Workers’ Compensation Law at the Crossroads, authored by Gregory M. Duhl of William Mitchell College of Law and Jaclyn S. Millner of Fitch, Johnson, Larson & Held, P.A. It’s a substantial document – 75 pages, to be precise, that looks at the use of social networking evidence in workers’ compensation litigation. It’s scheduled to be published in the Pace Law Review, but you can download a free copy of the report at the above link. We’d encourage you to run, not walk, to get your copy – it’s interesting, well written, and thoroughly annotated, and you don’t need to be an attorney to find it valuable. “The lawyers, judges, insurance companies, and parties within workers’ compensation systems will increasingly confront the discovery, privacy, professional responsibility, and evidentiary issues that arise at the crossroads of workers’ compensation law and social networking. In the absence of case law and ethics opinions that discuss these exact issues, this article starts with the rules that govern workers’ compensation cases, and discusses how they might apply to lawyers gathering, producing, and introducing evidence from social networking sites. But this article is only a starting point. 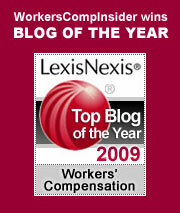 As workers’ compensation systems are built on efficiency, flexibility, and discretion, workers’ compensation is an ideal area of law for lawyers and judges to experiment with how to address some of the unique challenges and opportunities that social networking poses in litigation. In the spirit of those remarks, we’d like to leave you with this video clip which gives a good overview of how social media is changing the landscape. Startling as it is, it’s already almost a year out of date. This entry was posted on Wednesday, September 22nd, 2010 at 12:47 pm	and is filed under Law, Social media, Videos. You can follow any responses to this entry through the RSS 2.0 feed. Both comments and pings are currently closed.